The Church of England is to trial a new scheme to attract back former worshippers by opening McDonald’s bars in their churches and cathedrals. The move comes following a decline in churchgoers, particularly in the 50+ age bracket. Archbishop Keith Wilson believes the move will be very effective in bringing back those members, and attracting new younger members. “Having analysed the idea, we believe that this scheme will bring back the senior church members by making the church more attractive to young children. Many grandparents only get to see their child at weekends and are forced to choose between their family and the church. 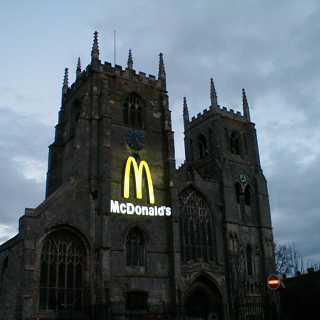 St. Margaret's Church in King's Lynn is one of the first churches to be running the new McDonalds scheme. If successful in attracting children and middle-aged worshippers, the Church already has plans to attract back one of its least represented demographics: 18-36yearold males.